The history and culture of food fascinates me – especially when it is represented visually. This is probably why I started collecting vintage cook books and pamphlets. I am especially drawn to the delightfully illustrated recipe and entertaining pamphlets, or booklets, published by companies for homemakers in the 1930s, 40s, 50s, and 60s. In the 20th century advancements in the way people stored and cooked food at home changed dramatically. Food and appliance manufacturers published recipe pamphlets to encourage homemakers to use their products in their own home kitchens. Through the use of these materials, companies achieved brand name exposure while providing consumers with new and exciting ways to use their products. These beautifully illustrated recipe pamphlets were selling more than just products, they were selling a lifestyle – a lifestyle to which homemakers could aspire. Reading and using vintage cooking pamphlets is a great way to discover unknown recipes and a variety of foods and dishes that were at one time commonplace – gelatin salads, jelly braid, floating islands, noodle oyster loaf and boiled tongue. 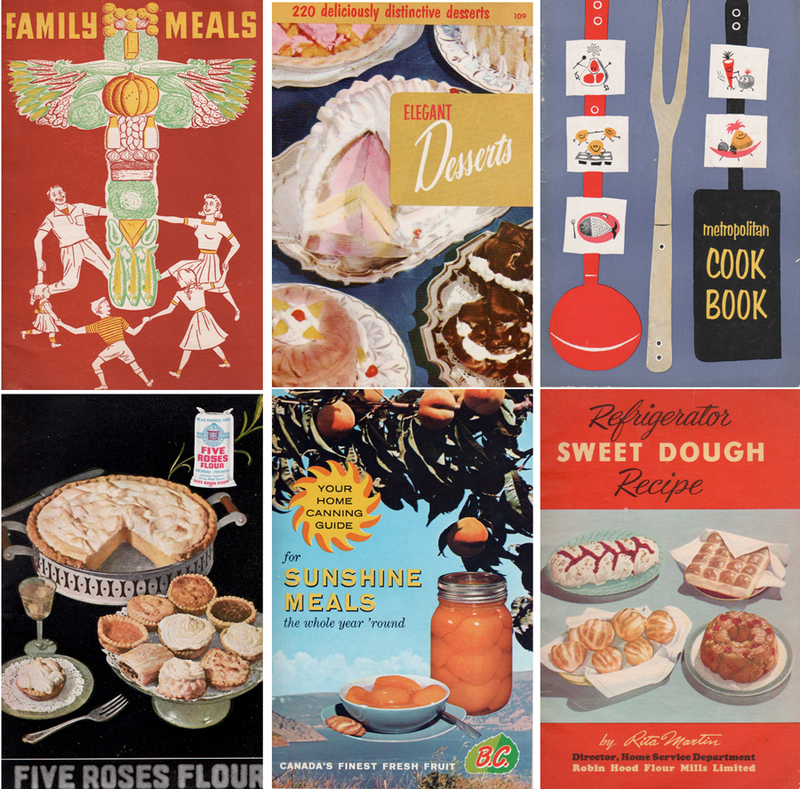 Composite of covers and photography from various cooking pamphlets and books, 1938 – 1957. Feeding the family is one of the homemaker’s most important jobs. You want to serve meals that look good and taste good. You want your children, your husband, and yourself to eat all the foods needed for good health. You must keep within your budget as well. All this takes skill and careful planning. The following ideas for menus, marketing, and recipes are intended to help you plan easily and wisely. It wasn’t only food and appliance manufacturers that produced these recipe and homemaking pamphlets. They were also produced by newspaper and magazine publishers, insurance companies and agricultural organizations. 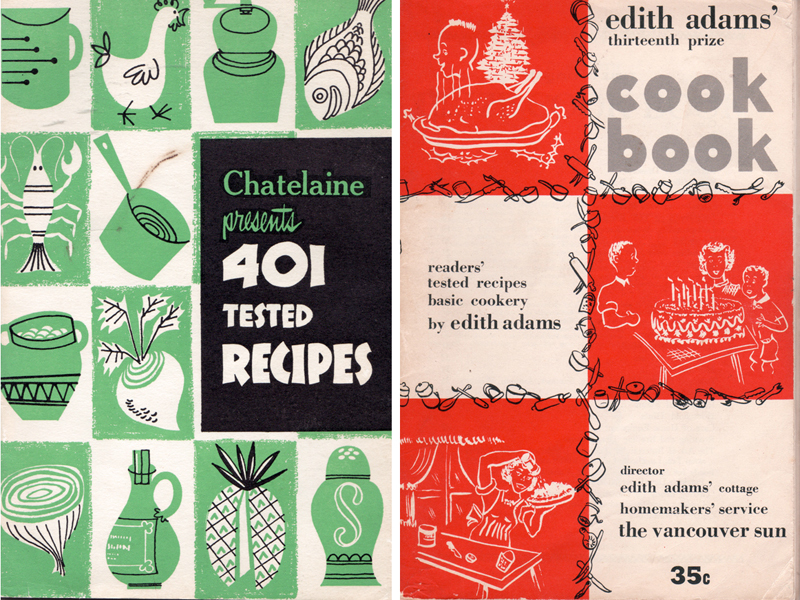 Cover for two pamphlet sized cook books: “Chatelaine presents 401 Tested Recipes”, 1956 and “Edith Adams’ Thirteenth Prize Cook Book”, 1950. Edith Adams was a fictional homemaker; the invention of a newspaper editor. Over the years various reporters and editors took on the role of Edith Adams, doling out sage advice, homemaking tips, and recipes to Vancouver Sun readers. A Vancouver Sun institution for 75 years (starting in 1924) Edith Adams’ Cottage has been recently revived with this fantastic website. If you are interested in the history of food and culture, it is definitely worth checking out. This pamphlet from 1950, is a collection of reader’s recipes sent to Edith Adams. But this cook book is more than just recipes, it is also a “summary of balanced, low-cost menus for the four seasons of the year” and an entertaining guide. Advising women on how to give their families good meals in the face of high food costs has become one of the most important phases of The Sun’s homemakers’ service. Composite images from “Casseroles and Economical Meat Dishes” booklet, 1950. Vancouver’s other daily newspaper produced this “Casseroles and Economical Meat Dishes” pamphlet also in 1950. I suppose with the post-WWII baby boom in full swing, there was a greater need for homemaking advice and content. 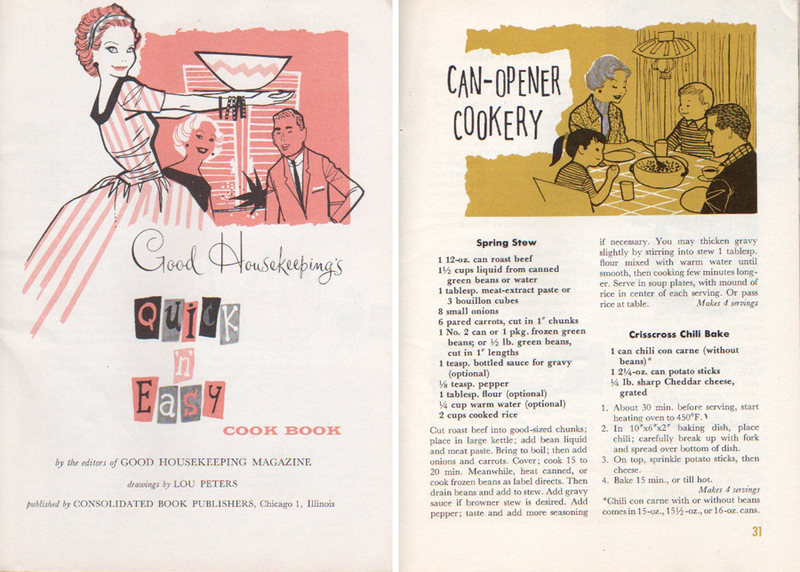 Title page and “Can-opener Cookery” page from Good Houskeeping’s ‘Quick n’ Easy Cook Book’, 1958, Hearst Corporation. Features the three ingredient (two of them canned) recipe for “Crisscross Chili Bake’ . Though many convenience foods (such as canned soup, ketchup, ready-to-eat breakfast cereals and sweetened condensed milk ) predate the 20th century, it was after both WWI and WWII that they really took off. Developed in 1937, the canned processed meat product SPAM was used as war rations for Allied troops. After the war, convenience foods, like SPAM, were marketed to consumers not only for their storage longevity and ease of preparation but also as wholesome substitutes for natural foods. 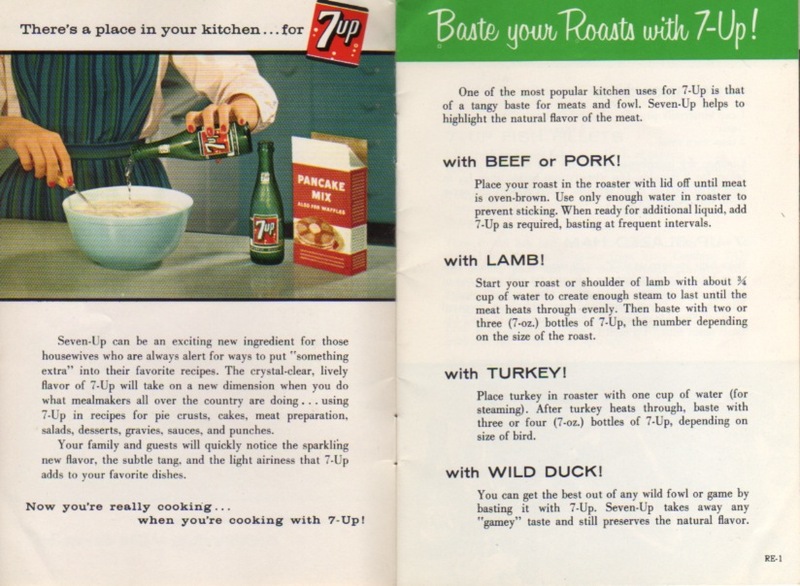 So it was only natural that the manufacturers of these products looked for ways to promote the use and benefits of these convenience foods via free recipe books. 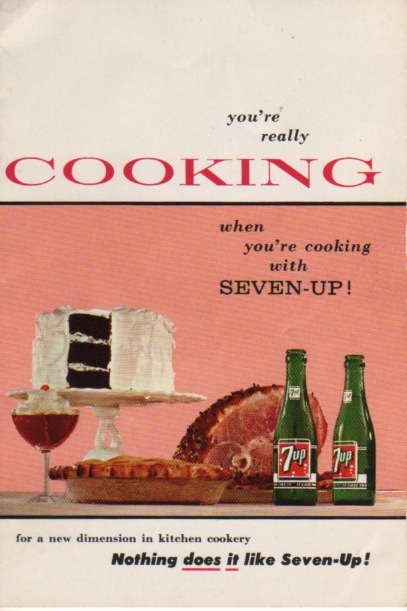 7-Up recipe pamphlet cover, 1957. 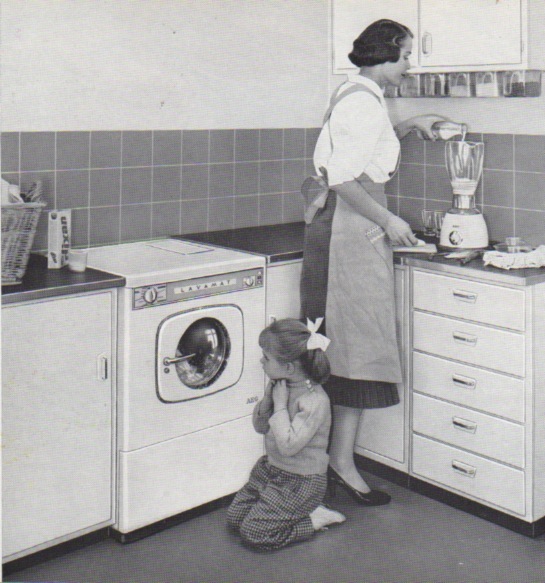 In the 1950s and 1960s homemakers were encouraged by advertisers to embrace the frozen, dehydrated, canned and boxed foods that promised to save time in the progressive modern era. The image (below) of a woman preparing boxed pancake mix with 7-Up epitomizes this movement. Verso and first page from 7-up recipe pamphlet, 1957. 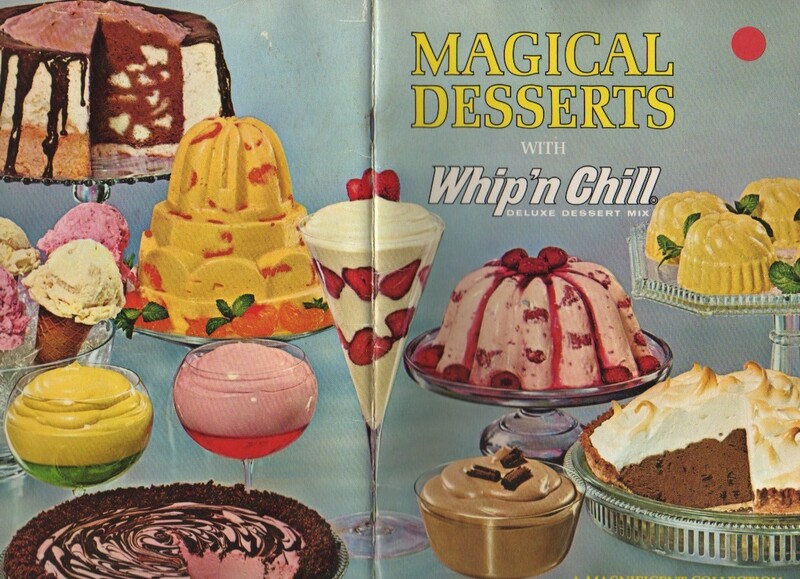 In the 1970s my family and I were regular consumers of Jello’s Whip’n Chill. Usually, it was a dessert of lemon Whip’n Chill with frozen blueberries or a boozy, chocolate Whip’n Chill mousse. Never anything as fanciful (or magical) as the concoctions depicted in the recipe pamphlet below. Magical Desserts with Whip n’ Chill cover, General Foods Corp.,1965. 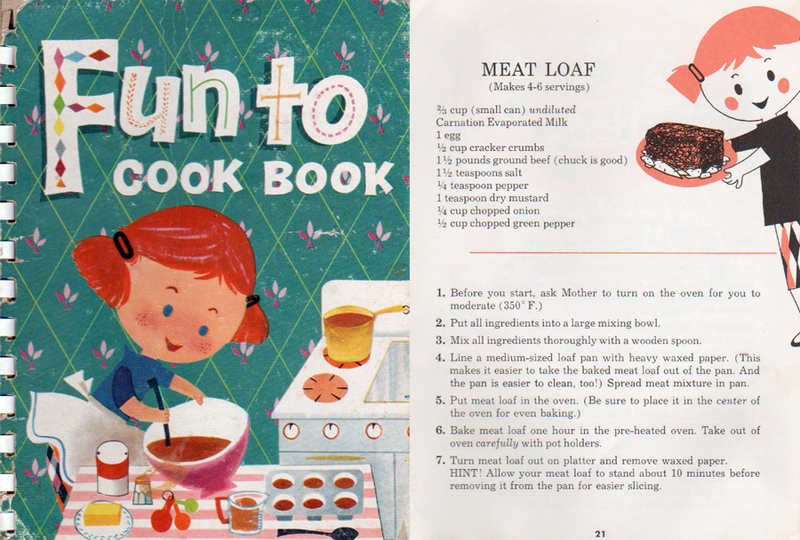 Cover and ‘Meat Loaf ‘recipe from the ‘Fun to Cook Book’ , Carnation Company, 1955. When Mother’s Wednesday Club came to our house for afternoon dessert and bridge, I helped her make the dessert the night before. She had so many other things to do (and needed time to get “prettied up” for her party, too! ), we decided to fix these easy things: Tropical Freeze, Chocolate Brownies and Coffee “creamed” with Carnation. Reading and using vintage cookbooks is a great way to peek into the domiciliary side of our culture and history. The following recipe for Cherry Olives is from “Your Home Canning Guide for Sunshine Meals”, a canning and fruit recipe booklet from the fruit growers of the Okanagan and Kootenay Valleys of BC. I’ve never tasted pickled cherries, but the idea of munching on them while sipping a cocktail on a sunny patio appeals to me. As it is currently cherry season, this is one vintage recipe I am eager to try. Use mature sweet cherries; pack unpitted and with stems attached in sterilized jars. It is advisable to use jars with glass tops. Do not pack too tightly. Mix vinegar, water, sugar, salt and heat to just under boiling point in covered enamel pan. Pour hot vinegar mixture over the fruit in jars. Add ½ teaspoon mixed pickling spice per pint. Seal. Store in cool place. Allow one month to cure. Yield 9 to 10 pints. Burrard Bridge celebrates 81 years! I inherited many of these…. Chicken is available all year now? Ye gods and little fishes!